I remember a time at work when we had a problem. It was a big problem, involving a huge amount of data. I sat down with the resident data guru, and she tried to explain what the matter was by dancing around between two spreadsheets that spanned a couple of very large monitors, flitting from row to row, column to column in a way that was both easy and natural to her. She had this data under total control. She could see patterns and connections in it, trends and meaning in the vast sea of numbers. I sat and nodded a lot, trying not to look lost at sea, which is exactly where I was, obviously. I went away no closer to solving that particular problem, and it took a very different approach to eventually get anywhere. Later, I told somebody else who had a similar mastery of that particular set of data about the issue. He got up and headed for the printer, and came back with a big piece of A3 paper and a pack of coloured pens. He started to draw big circles, and connected them all up as he talked about the same things that my other colleague had done, but this time, it all connected. The picture grew, and I had something I could see and feel, something that helped me to relate to The Problem, and ultimately to see what I needed to do to solve it. He drew a diagram. That’s all. Just a picture, but a picture that added context and meaning to the concepts I couldn’t grab, that brought them to life and made them easy for me to understand. It’s hard to browse the Internet for any length of time these days without stumbling over an infographic of some sort. They’re everywhere, and there’s good reason for that, because presenting information in the form of pictures is a compelling and effective way of helping people to take it in quickly, and if there’s one thing the Internet is about, it’s about speed to digest. 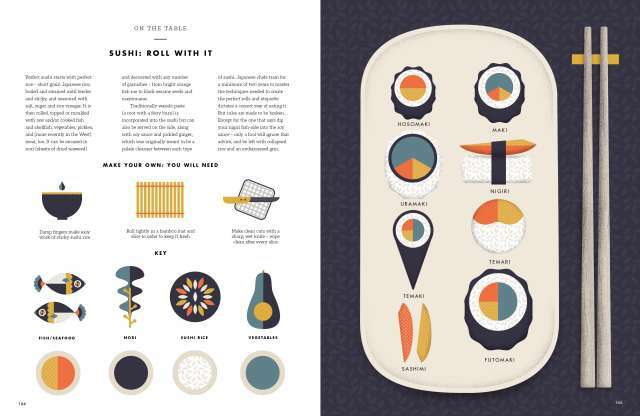 And here’s a huge book full of infographics about food. 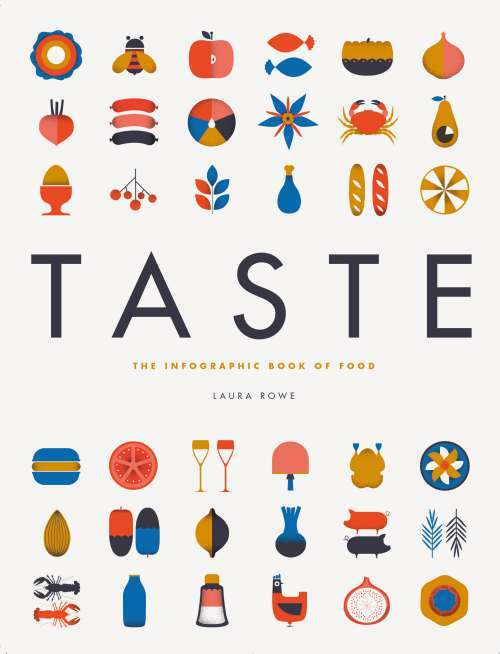 Laura Rowe, in her book Taste: The Infographic Book of Food, has collected together over two hundred pages of food related words and pictures, ranging across subjects such as the proper names for all those weird pasta shapes through to the best thing to do should you be lucky enough to stumble across a truffle. There are a few recipes in there, cleverly broken down into pictures, but the real strength is in the book’s ability to decipher the difference between things that look similar but are vastly different – those pasta shapes are a good example, as are the pages on different types of molluscs, and the ones on the shape of various cuts of steak, and so on. This is a very ‘of the moment’ book. It grabs hold of a current idea and runs with it as far as possible, and that’s no bad thing. It’s a fascinating book that’s easy to browse and dip in and out of, and the information in it is both relevant and useful. I found it best used as a bit of a lucky dip … I’ve read the odd page every now and again, and I think by now I’ve pretty much read the lot. There’s a lot of good stuff lurking within, and it’s a useful resource for those times when you need to know that bit more about something. My only complaint? There’s no proper index at the back, just a list of contents at the front. That works, but it doesn’t work like an index would, but that’s a minor gripe in the face of such an entertaining and engaging work. 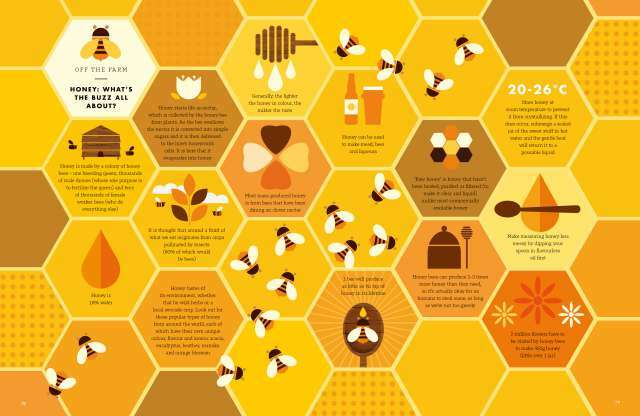 Images from Taste: The Infographic Book of Food by Laura Rowe, illustrations by Vicki Turner. Published by Aurum Press, £20.